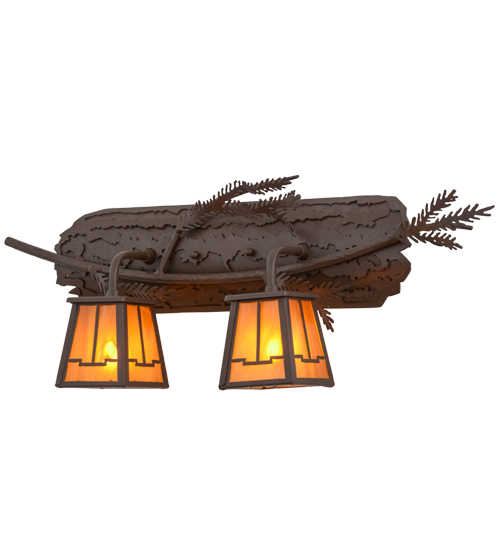 Description: Enjoy the natural beauty of the American woodlands with this stunning two wall luminaire. Designed as a tree bark with branches and Pine needles, the hardware is featured in a handsome Cafe Noir finish. Two Arts & Crafts styled lanterns feature stunning Honey Opal glass. Use as a vanity light in a fine bath or as a wall sconce in a hallway. Handcrafted by highly skilled artisans in our 180,000 square foot manufacturing facility in Yorkville, New York. Custom colors, styles and sizes are available. Dimmable energy efficient lamping options. UL and cUL listed for dry, damp and wet locations.